As the designers of the Belső Udvar Office, we endeavour to apply the principles of environmentally conscious and healthy building design as extensively as possible. We design the houses in harmony with the built and natural environment; we also try to abstain from unnecesarry formal aspects. Through the selection of building materials we try to use products that are environmentally friendly and do not represent a danger for the workers or for future dwellers. The building machinery used represents the "gentle technologies", and by their selection we consider the complete lifecycle of the equipment as well as the benefit to the users. Because of physiological and ecologic advantages we prefer the usage of multi-layer adobe structures. Our prices vary according to the plan's type (permission or construction plan), complexity and scale; all following the regulations set down by the Chamber of Hungarian Architects; and always individually calculated. We gladly give a 10% discount to ecologically conscious projects. We, the staff of the Belső Udvar Office, with the creation and maintenance of the Database of Ecofriendly Building and the fenntarthato.hu (=sustainable) website have been collecting significant expertise on ecologic building on the theoretical as well as the practical field. We give expert advice on energy conscious renovation, possible usage of renewable resources, rain water collection, physiological effect of building materials and alternative waste water treatment, from the scale of a family house up to townships. An essential part of an ecologically conscious building is the minimization of energy needed for heating or cooling, calculating for the optimization of the users' climatic comfort. In everyday usage the building site, the structures and accessories, the machinery, the style of usage and the external weather conditions have various effects on the buildings, so on the internal climatic comfort levels. There are several method to reduce the environment load and to optimize the internal comfort level. 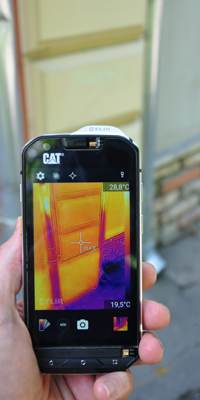 Energy Audit is the method where the consumptions of a specific building with specific consumers is examined. In the first step we specify the measured consumption of the building based on energy bills and measures. In the second step we calculate the theoretical consumption of the building based on different calculation software. Finally we give advises on the cost-effective reduction of consumption based on the analysis of the measured and the calculated results. Dynamic Building Simulation is used in our office to calculate the energy consumption of very low energy buildings and to examine the building in summer conditions. During the design phase it is useful to make detailed building simulations that can predict the thermal conditions for each room on an hourly basis. With computing assistance, errors of design that can lead to uncomfortable conditions, can be avoided (and revised structures can be recommended) in advance. During last year's design and research work we became familiar with various software and provide consultancy in projects from family house scale to large public buildings. The building sector has been experiencing significant changeds in the recent years, and and this trend will likely to continue in both Hungary and in the wider world. Problems like shortage of dwellings (in number and in quality) for the population of the World; the harm that building industry and the common use of houses cause to the natural environment; global climate change have to be seriously considered by architecture in the near future. This endeavour has to be accompanied with other important disciplines, in order to find the proper architectural/social/technical answers. For us, in the Belső Udvar Office, with the practical experiences of construction, participation in national and international research projects are very important. In line with the expertise and experience of our staff, the office mainly participates and initiates research projects in sustainable building, building ecology and building biology. We participate in research projects after individual consideration of each project. The staff of Belső Udvar Office has experience and success in tendering (preparations or full implementation) for parity funds from Hungary or from the European Union. In tendering (preparations or full implementation) for parity funds from Hungary or from the European Union, The project budget of these tenders ranged from 100,000 HUF up to 6 billion HUF. Relying on our experiences of many years we offer full assemble of tender dossiers or merely consultation. We participate in tendering projects after individual consideration of each project.